Those who have been waiting for the best time to watch gray whales off Southern California this season should note that the northbound migration period has begun to peak. On Monday, volunteer spotters with the Gray Whale Census and Behavior Project at the Point Vicente Interpretive Center on the Palos Verdes Peninsula, tallied 50 northbound gray whales. That's the highest count since last March 21, when 64 gray whales were spotted. That represented the highest count in more than 10 years. About 20,000 whales are en route from Baja Calfornia breeding grounds to summer feeding grounds in Arctic waters. The northbound migration is spread out — some whales have already passed San Francisco and at least a few have entered San Francisco Bay — but this is the peak period off Southern California. Most landings are sending boats out daily or on weekends for trips lasting 2-3 hours, but those who'd like a longer adventure might consider joining the Ultimate Whale Watch journey Saturday aboard the Monte Carlo out of 22nd St. Landing in San Pedro. The trip, a fund-raiser for the American Cetacean Society's Los Angeles Chapter (ACS-LA), is from 8 a.m. to about 5 p.m. and will include a visit to the west end of Catalina. Cost is $71, or $61 for ACS members. Tickets can be purchased online or by calling (424) 266-0516. Those who live closer to Orange County might consider ACS-OC Around-Catalina adventure on April 1 aboard the Catalina Flyer out of Newport Beach. It'll run from 9 a.m. to about 6 p.m. Departure is from 400 Main St. Cost is $60 for members and seniors, $75 for non-members, and $35 for children 10 and younger. Reservations can be made by calling (714) 375-1192. Both trips are timed to coincide with the peak period of the northbound migration. When gray whales congregate in Baja California lagoons each winter to mate and nurse their young, they often swim up to small boats and allow for intimately close encounters with astonished whale-watchers. Apparently, some of these "friendlies" are continuing this practice during their return voyage to Arctic home waters. 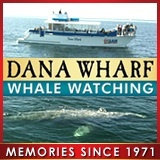 The accompanying videos contain footage of gray whales, presumably adults, interacting with passengers aboard the Dana Pride (top video) and Reel Fun (bottom video) on Friday out of Dana Wharf Sportfishing and Whale-Watching in Orange County, Calif. The Reel Fun is a fishing boat and those are U.S. Marines -- who put their fishing equipment aside during the encounter -- being introduced to a smelly blast of whale breath. These types of ultra-friendly encounters with gray whales are not common beyond lagoons, probably because once gray whales begin their northbound migration, they're on a mission to reach their objective. Said Donna Kalez, general manager of Dana Wharf landing: "This has to be good for tourism in Orange County. If the whales are doing this here, people don't have to go to Baja to see it." A Massachusetts angler on his first trip to Cabo San Lucas, to celebrate his 60th birthday, spent four wearying hours Thursday reeling in a mighty swordfish. Al Monte was with his two sons aboard the Tracy Ann out of Pisces Sportfishing, but battled the 391-pound broadbill by himself about six miles beyond the Old Lighthouse on the Pacific side of the Baja California peninsula. Swordfish catches are rare off Cabo San Lucas, which is world-famous for its marlin fishing. Perhaps a dozen are caught each year. The Montes earlier the same day caught and released striped marlin weighing an estimated 140 and 160 pounds. The Tracy Ann is captained by Julio Castro, who has a knack for finding marlin and big fish. Martin Gonzalez is the regular deckhand. Last fall this crew was aboard the same cruiser during the catch of a 749-pound blue marlin. Oregon, Washington and Idaho have been authorized by NOAA Fisheries to ''permanently remove" California sea lions that gather at Bonneville Dam each spring to gorge on imperiled salmon and steelhead as they migrate up the Columbia River to spawn. The authorization, sure to inspire cheers among fishermen and anger among environmentalists, enables state officials to euthanize a combined 92 sea lions per year, if no permanent holding facility can be found and if deterrence methods are unsuccessful. However, NOAA estimates that only 25-30 sea lions will be removed annually. Under the Marine Mammal Protection Act, NOAA has the authority to grant states permission to kill specific sea lions known to have a "significant negative impact" on at-risk salmon and steelhead. California sea lions have devoured an estimated 1.5% to 4% of returning adult salmon at Bonneville Dam each year for the past eight years. About a third of the fish were spring Chinook or steelhead from federally endangered stocks. In 2010, about 6,000 salmon and steelhead were consumed by sea lions. Last year the number was estimated at 3,600. The West Coast population of California sea lions is estimated at just under 300,000. How to keep game birds from spoiling when in the field? Answer: As I’m sure you are aware, the most important thing to do with game is to keep it clean and dry, and to cool it down ASAP. DFG Upland Game Bird Stamp Program Coordinator Karen R. Fothergill says she can’t promise the birds are still safe to eat. She points out that most of us spend several hours in a day out hunting and by the time we get our birds home, many hours have passed. If you refrigerate them as soon as you return from the field, and it’s the same day you are hunting, it is likely they will be fine and ok to consume. However, if they are left in the back of a truck in the heat, then you may be taking a chance. Small birds like quail will cool on their own (somewhat) much faster than a large goose will. Since ideal handling is not always an option, preparing for the worst situation is always the best plan. Hunters should keep an ice chest with cold packs or sealed bags of ice handy to quickly cool down their game birds without adding moisture. Moisture and warm temperatures create the perfect environment for bacteria to grow. If you are concerned about the birds spoiling, you can always gut the birds immediately upon taking possession of them. This will allow them to cool quickly. Remember that you are responsible for proper game care, and letting the birds go to waste is a violation. DFG advises that you do everything you can to cool your game quickly so you can enjoy your harvest. It has been said that a person's chance of being struck by lightening is greater than that of being attacked by a shark. But the adage might not apply to Florida or, specifically, New Smyrna Beach in Volusia County. The oft-labeled shark attack capital of the world was the site Wednesday of two minor attacks within five minutes, believed to have involved two sharks. The injuries were not life-threatening, according to the Daytona Beach News-Journal. One of the attacks involved a 17-year-old male surfer who suffered a calf wound. The other involved a 15-year-old girl who suffered a bite to the ankle. Both surfers were in the same general area. The sharks were estimated to measure 4-5 feet, suggesting that they were schooling sharks feeding on schooling bait fish. The beach was closed, but only temporarily. Interestingly, the International Shark Attack File lists the number of lightening fatalities in coastal U.S. states versus the number of shark attacks and shark attack fatalities, from 1959-2010. Only Florida, California and Hawaii boasted more shark attacks than lightning fatalities. Florida lists 603 shark attacks and 459 lightning fatalities. California lists 89 and 30, and Hawaii lists 97 and zero. Only Hawaii, with six fatal shark attacks during that period, boasted more fatal shark attacks than fatal lightning strikes. As for Volusia County, the ISAF lists 242 unprovoked shark attacks on humans in county waters between 1882 and 2011. The next closest county is Brevard, just to the south, with 103 attacks. Not one of the Volusia County attacks resulted in a fatality. These attacks generally involve small sharks mistaking arms and legs of surfers and swimmers as possible prey. A giant manta presumably was hauled up dead after becoming entangled in the anchor line of an oil-rig servicing ship off Nigeria's Bonny Island. But guess what? It was sold to fishermen that was around when it was killed at the amount of five thousand naira only. It could have been preserved. My friend is one of the people on the ship deck." With his dad and grandfather still following in his wake, Dallas Seavey made history Tuesday night by becoming the youngest musher to win the Iditarod Trail Sled Dog Race from Anchorage to Nome. Seavey, 25, crossed the finish line before cheering fans on Front Street at 7:28 p.m. local time, completing a grueling 975-mile competition that began March 4. He finished comfortably ahead of Aliy Zirkle and Ramey Smyth, who were expected to finish second and third, respectively, and beat an age record held by five-time Iditarod champion Rick Swenson, who won his first time out in 1977 at age 27. Zirkle, 41, who held the lead for much of the past week, posed the only real threat to Seavey after following him out of the White Mountain checkpoint, 80 miles from Nome, with more than an hour to make up. But she could not gain enough ground in what's billed as "The Last Great Race." Sled-dog racing is definitely in Seavey's blood. His father Mitch, winner of the 2004 Iditarod, was in seventh place at the time his son crossed the finish line. Dan Seavey, 74, who finished third in the first Iditarod in 1973, was 53rd out of 55 mushers still in the race. Defending champion John Baker was in eighth place and four-time champion Lance Mackey was 27th. On beating his father, Dallas Seavy quipped to the the Alaska Dispatch, "I think he always hoped it would come after he retired." Smyth, 36, might have contended more closely for the title were it not for a mishap at the start of the race, and illness among some of his dogs late in the contest. On the first day of the Iditarod, Smyth tumbled from his sled after falling asleep, and spent the next 40 minutes chasing after his team of dogs. The annual race, which was first staged in 1973, is a tribute to the role sled dogs have played in Alaskan culture and a means of preserving an historical trade route. Barring unforeseen circumstance, Dallas Seavey, a third-generation musher from Willow, Alaska, will become the youngest person to win the historic Iditarod Trail Sled Dog Race. Seavey, 25, who was the first musher into the White Mountain checkpoint, maintained a commanding lead when he pulled out Tuesday morning, and was expected to cross the finish line at about 6 p.m. to complete the historic 975-mile competition. In the accompanying video, courtesy of the Anchorage Daily News, Seavey talks about his recipe for success on what is often a grueling competition in harsh elements that test the mettle of mushers and their dogs. His closest competitor on Tuesday morning was Aliy Zirkle, but she appeared to have been too far back to mount a significant threat. Among those Seavey will out-pace are his father, Mitch Seavey, who was in seventh place early Tuesday, and his grandfather, Dan Seavey, who was in 55th place and close to the back of the pack. Dallas Seavey, after arriving at White Mountain, told the Daily News that becoming the youngest Iditarod champion was his goal all along. "That's been something I've really been working toward for five years now, and now that it's almost a reality is pretty cool."